Test tolerances (along with reference values are used to determine whether a test is passing, at tolerance or failing. Configuring the different kinds of tolerance values are described below while the procedure for setting reference and tolerance values for a given test on a unit is described elsewhere. 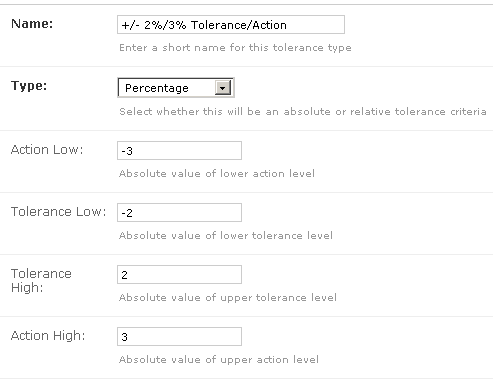 To create a new tolerance click the Tolerances link under the QA section on the main admin page and then click the Add tolerance button at the top right hand corner. 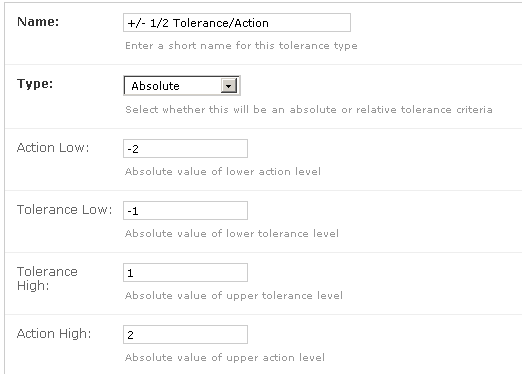 Choose the Tolerance type you want to create and fill in the appropriate values (described below). A tolerance object should very rarely need to be edited and should only be done if you understand the implications of doing so. When test values are stored, it keeps a reference to the tolerance that was set at the time the test was performed. If this tolerance object is later edited it will appear that the tolerance level for those test instances was different than it actually was at the time the test was performed. 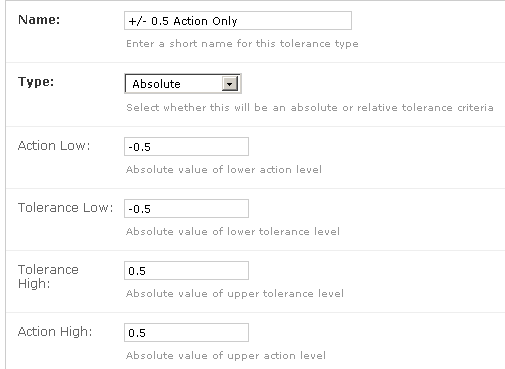 The tolerance/action levels of a test act as a window around the reference value. For example if a certain test on a unit has reference value of 50 and a tolerance/action level of +/- 2%/3% (i.e. lower action = -3%, lower tolerance = -2%, upper tolerance = 2%, upper action = 3%) then values between 49 and 51 will be considered within tolerance, values between 48.5 & 49 or 51 & 51.5 will be considered at tolerance and values less than 48.5 or greater than 51.5 will be considered failing. Note that you are free to leave one or more of the tolerance and action levels empty. This allows you to create tolerances which are pass/fail only (Tol Low & Tol High are both left blank), pass/tolerance only (Act Low & Act High are both left blank) or one sided tolerances (e.g. Act Low & Tol Low are left blank). Numerical tolerances can either be specified as absolute or percentage. An example of a percentage based tolerance is given in the previous paragraph. Absolute tolerances differ from percentage tolerances only in the way the window around the reference value is calculated. For example if a certain test on a unit has reference value of 80 and an absolute tolerance/action level of +/- 1/2 (i.e. lower action = -2, lower tolerance = -1, upper tolerance = 1, upper action = 2) then values between 79 and 81 will be considered within tolerance, values between 78 & 79 or 81 & 82 will be considered at tolerance and values less than 78 or greater than 82 will be considered failing. Multiple choice tests can be subjected to pass/tolerance/fail criteria by using the Multiple Choice tolerance type. First choose the Multiple Choice option for the Type field and then enter a comma separated list of choices which are to be considered passing and a comma separated list of choices which are to be considered tolerance values.